Despite all the efforts being put into expanding renewable energy sources, large-scale power stations will be essential as part of a reliable energy supply strategy for a longer period. Given that they are low on CO2 emissions, many countries are moving into or expanding nuclear energy to cover their baseload supply. Selected chapters from the German concrete yearbook are now being published in the new English "Beton-Kalender Series" for the benefit of an international audience. Since it was founded in 1906, the Ernst & Sohn "Beton-Kalender" has been supporting developments in reinforced and prestressed concrete. The aim was to publish a yearbook to reflect progress in "ferro-concrete" structures until - as the book's first editor, Fritz von Emperger (1862-1942), expressed it - the "tempestuous development" in this form of construction came to an end. 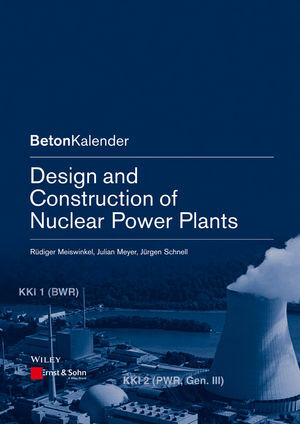 However, the "Beton-Kalender" quickly became the chosen work of reference for civil and structural engineers, and apart from the years 1945-1950 has been published annually ever since.